Everyone Celaena Sardothien loves has been taken from her. But she's at last returned to the empire—for vengeance, to rescue her once-glorious kingdom, and to confront the shadows of her past. Queen of Shadows was an intense but extremely satisfying read. Everything about this was the perfect instalment that I had been waiting for. The story predominately focuses on its characters and their development. There is a lot of character progression, which is so good because it creates another dimension and makes them so much more believable and relatable. Celaena's story arc just keeps getting better and better. It's still possible to see her old self, but her new maturity and resilience really strengthens her character. Unfortunately, there's not a lot of exploration of Dorian and Chaol's character, although Maas does set up for possible development in the next part. Plotwise, events are clarified to fully understand the direction of the rest of the series. There were also hints of what could potentially happen, which I'm excited for! Much like the previous books, Maas writing excels, being able to draw me in and keep me engrossed in the world. I do have some trouble concentrating during the first 100 pages or so, but that's probably because it was awhile since I read Heir Of Fire. There's so much creativity, it just breathes magic. 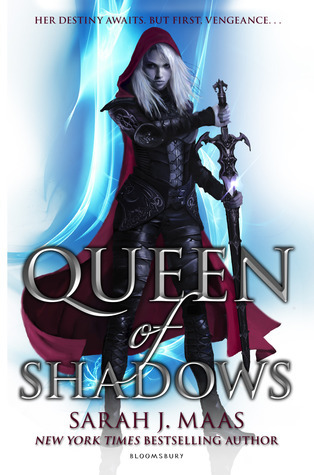 If you have not read Queen of Shadow or even the series get on it! This is an amazing series that has an epic storyline and badass characters. Trust me, you won't regret it. It's amazing to witness Celaena the Assassin (both in Throne of Glass and The Assassin's Blade) transform into the mature and passionate Aelin, Queen of Terrasen. I love that she's found her true identity without losing her confidence and sassiness. I cannot wait to see her claim her own throne back and rule with her new found strength and maturity. I'm so proud of her! I don't particularly like how Chaol's character arc was dealt with though, even if he isn't a favourite of mine. He's sort of diminished entirely from the brave captain to someone filled with doubt and hopelessness. In the scheme of things, it does make sense. You have someone who's blindly followed an evil tyrant and was unwilling to accept anything different. Once the world he knew crumbled he was pretty much at lost. Still, I would like to see some of the old Chaol come back in the next part. Rowan is fast becoming a swoon worthy character. His physical appearance and personality is pretty much perfection. I don't particularly see his current purpose besides protecting Aelin, but there's this bond between them that does make their relationship development almost believable. Almost. Manon annoyed me so much until the last third of the novel. I like that Maas is using her character to explore the issues of morality and values versus obedience and pride. I'm super excited to see what her role will be considering she's now found some humanity and compassion. Surprisingly, Lyssandra has now taken a place in my heart. She is wickedly awesome and her friendship with Celaena is so fun to read. I like that they can both rely on each other now after being manipulated against their each other all their lives. Very heartwarming. The world has expanded significantly and will continue to do so. This gives the plot so much more potential and I'm loving the setting of each area. I'm curious as to see how big Terrasen will be and it's actual environment. Finally figuring out who the Duke really is and his and the King's actual purpose in breeding the Wyverns and relying on the witches help was actually fascinating. It really broadened the potential of the plot, and how much can take place in the future. I wasn't particularly interested in Elide's storyline just because I didn't see a purpose. It's still early days for her though. The romance element is something I like only because it's the most realistic account of dating between characters. Well, "dating." She's able to date who she wants and see the relationship development before deciding if her partner is compatible and what she really wants out of a relationship. There's no instal-love that has stretched across the four books, thank gosh. I want to see her relationship with Rowan as stemming from their lengthy time with each other but also a pull from their fae heritage. “They joined hands. So the world ended.